Christmas time. I love it so. Holidays, Summer, feasting, family and friends – a few of my most favourite things all rolled into one. So glad it’s here. It’s hard to believe, but it was Christmas two years ago that saw the birth of stonesoup. I had been toying with the idea of starting a blog for a few months but had decided to leave it until I had some time to devote to figuring the whole thing out. I’d started a list of potential topics to cover (I know I know, I am a Virgo, not much happens in my world without a list) . I began to think my little sis was starting to loose itâ€¦I mean at that time I had a boyfriend and really wasn’t on the lookout for another man in my life, especially not one who could fit into such a small box. With curious thoughts buzzing around my head, I tore through the paper to reveal a very handsome grinder made of wood with Mr Dudley proudly engraved on his base. It was love at first sight really, and Mr Dudley and I have been together since. 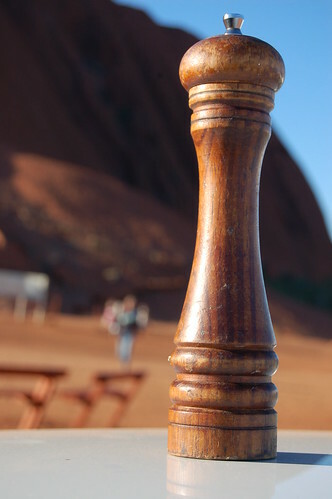 Actually Mr Dudley might be getting up there in contesting the title of the most well travelled pepper grinder in the world. Wherever I go, Mr Dudley goes. When I was moving to California he was one of the first things I packed. And I just couldn’t imagine my time living in France without my pepper guy to complete the seasoning on so many picnic meals straight from the markets. On my trip to the Northern Territory last year he was with me every step of the way from camping in Kakadu to checking out the sunrise over Australia’s most famous rock, Uluru. Years ago I remember reading a Chris Manfield recipe in the Good Weekend for such an icecream and my first reaction was ‘weird’â€¦ but after thinking about it and now actually making my own, I am definitely a convert. So much so that now I am toying with the idea of spicing up other sweet creamy classics like panna cotta. I like to serve this icecream all alone, with Mr Dudley on the table to add an extra hit if needed, but it would also work well as an accompaniment to luscious ripe strawberries or anything chocolatey. Lightly whisk yolks with pepper. Combine cream and sugar in a small saucepan and heat until almost boiling. Pour hot cream over the yolks. Whisk well then return to the saucepan and cook over a low heat, stirring constantly until the mixture starts to thicken enough to coat the back of a spoon. Remove from the heat and allow to cool a little. Stir through yogurt and refrigerate until chilled. Freeze in an icecream machine according to the manufacturer’s instructions. Enjoy. Here’s hoping your turkeys are moist (and preferably stuffed with another bird or two), that your hams are glazed to perfection and that all your Christmas dreams come true. Enjoy your holidays whether they be beachey or snow-capped. ps. To celebrate achieving the grand old age of 2, stonesoup is closing for a well earned break. I look forward to sharing more recipes and stories with you from the 7th of January. Hahaha, well it was a pleasure meeting Mr. Dudley :). Happy holidays! I totally agree on the adding-pepper-to-sweet-things idea. I sometimes do it myself and although people don’t usually understand what causes it, they like the interesting flavour! How sweet! I love a named kitchen utensil! And Merry Christmas & A Happy New Year to you, Jules! Jules, I’m so glad you decided to create your blog, as it’s a regular read when I’m online. Your photos really ought to be in one of those huge, glossy fabulous coffee table books. Congratulations on reaching two years, and here’s to many more to come. Happy birthday to Stonesoup. Well done Jules. Stonesoup is a gorgeous, gorgeous site – you should be well chuffed (and proud) of yourself for having created this beautiful blogging thing. I once (a life time ago) shared a house with Chris Manfield. We ate well! I have a couple of her books, and my favourite is “Spice”. 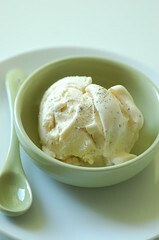 Love the sound of black pepper icecream. I rate black pepper as an underused spice and you will find it in my teas and fruit salads, lassis and other surprising dishes. Great post! I too am a Virgo and would be totally lost without lists! HNY, Jules. Guess I am one of the Virgos who didn’t get the to-do-list gene. Congrats on the milestone! 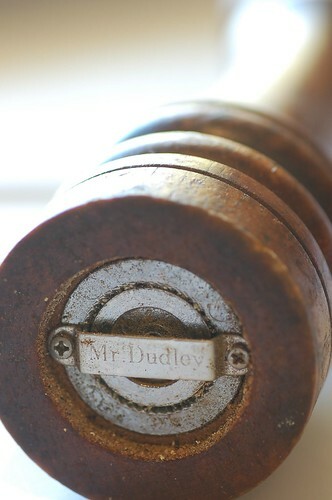 I’ve got an old wooden pepper grinder like Mr Dudley. Have had it about 30 years and though it’s not very pretty, it does a better job than all the fancy ones I’ve been seduced by (and discarded!) over the years. It’s so encouraging when people leave comments like yours… sometime I feel like there’s noone out there…really appreciate it. I know what you mean about dud pepper grinders… glad to hear I’m doing the right thing by being loyal to mr dudley. I love making ice cream but I haven’t made it since moving to Japan. Today, Paku, was just telling me how wonderful Shichimi (Seven Chili Spice) Softcream is. I was like, hmmm… pepper/chili ice cream? Seeing it here on stone soup makes it a whole lot more palatable to me. I think I will have to give it a try! Hi Jules baby, I’m a bit of a pepper grinder fanatic myself and the long and short of it all, is that it all comes down to the mechanism! Yes, Mr Dudley has a great mechanism but I’m of the opinion that ours is better – same quality but spring loaded so that one can adjust the courseness of the grind. I can also go on about the cutlery grade stainless-steel mechanism with a life-time guarantee, Zen shape to get the right mojo in your kitchen, gnarled indigenous hardwood for character plus a bit of substance in the hand (not quite a WMD but handy nonetheless). However, the proof of the pudding is in the eating as you of all people should know, so the best option would be to let you drive one of these pepper grinders. Watch your Xmas tree … or birthday, Mother/Father’s day, wedding as it makes for lifelong gift and trusted friend. Jules, can you tell me if Mr. Dudley had a stainless steel grinding mechanism or was it carbon steel ?